The Food and Drug Administration (FDA) requires shipments of nonprescription sunglasses include the “Drop Ball Test” certificate. This certificate confirms the safety and durability of the lens for impact resistance. Consumers, manufacturers, and sellers are required to test a batch of lenses prior to shipping them. The number of lenses tested for impact resistance within each batch or lot varies depending on material and type of lens being shipped. 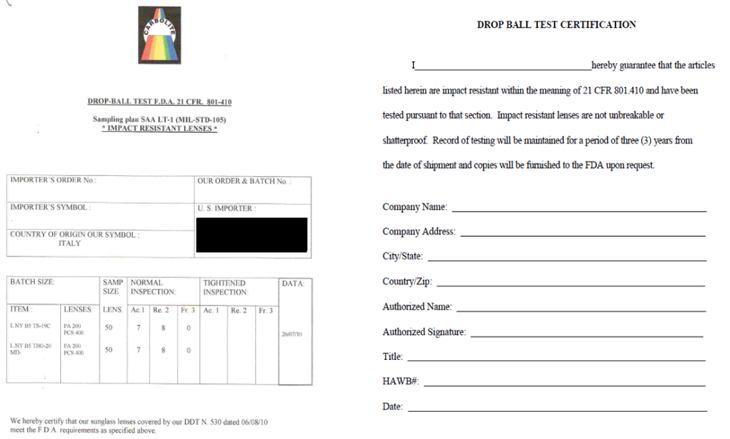 Records of the drop ball test must be maintained for a minimum of three years from the date of shipments for the FDA upon request.